From the flat-screen television in the living room of these North Myrtle Beach vacation rentals to the sparkling blue swimming pool located right outside, Coastal Dunes is a North Myrtle Beach resort that has it all. The North Myrtle Beach condominium rentals are spacious and well furnished and they are all on the oceanfront so the views are spectacular! Choose between a three-bedroom, two-full-bath North Myrtle Beach condominium at Coastal Dunes in the Ocean Drive section of North Myrtle Beach, South Carolina or a four-bedroom North Myrtle Beach vacation rental that has two full baths and one half bath and sleeps eight people. These beautifully decorated North Myrtle Beach condominiums have a fully furnished kitchen so you may conveniently prepare breakfast early in the morning before you head out to enjoy the Coastal Dunes swimming pool, the beaches or the nearby amusements. The kitchens in these condos in North Myrtle Beach, South Carolina even have a dishwasher. In addition to a dishwasher for cleaning your dishes, the vacation condos at Coastal Dunes also have a washing machine and clothes dryer so doing your laundry is a snap. With a washer/dryer unit conveniently located in the privacy of your North Myrtle Beach condo rental you can wash a load of clothes every now and then without disrupting your North Myrtle Beach vacation plans or having to make time to go to a nearby public laundry. Multiple televisions and DVD players in each North Myrtle Beach condo rental allow everyone in your family to spread out and relax quietly while watching their favorite shows and seeing their favorite movies. It is nice to have this option during your North Myrtle Beach vacation, especially when your days are full of fun and adventure and some rest and relaxation are definitely needed. The oceanfront balcony in each of these North Myrtle Beach condominiums is furnished. Spending time on your private balcony will come naturally because the panoramic vistas are breathtaking and the fresh sea air is rejuvenating. 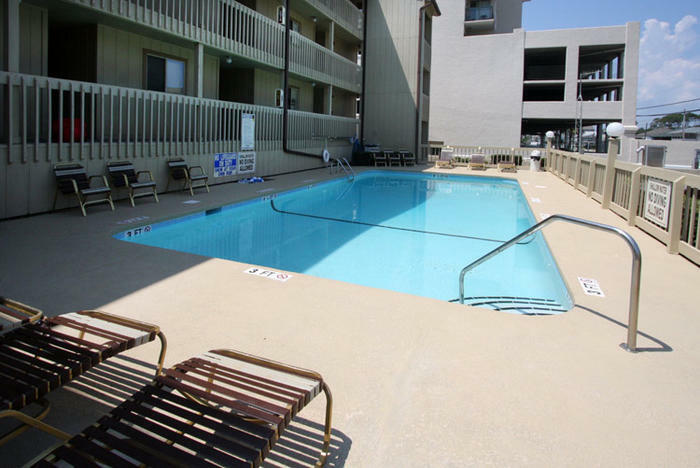 Inside and out you can enjoy fresh air in these non-smoking North Myrtle Beach condo rentals. There is a door leading to the beautiful views from the private balcony in the living room as well as in the master suite. Slip out to the oceanfront balcony when you first wake up in the morning of your North Myrtle Beach vacation and greet the day and see the ocean before you do anything else. That is the best way to start any North Myrtle Beach vacation day at Coastal Dunes. Some of the condos at this North Myrtle Beach resort have Internet access so if you find that you need to be able to get online during your North Myrtle Beach vacation at Coastal Dunes, the option is there in the selection of North Myrtle Beach rentals. Take a moment to also look at the Web sites of the nearby attractions, stores and restaurants as you plan your North Myrtle Beach vacation activities for the day. Coastal Dunes is built on stilts so that the ground level is a convenient covered parking lot. Park the car and take the stairs up to your North Myrtle Beach rental. Stairways are located at either end of the parking garage. The swimming pool at Coastal Dunes is on the opposite side of this North Myrtle Beach resort as the Atlantic Ocean. Take a dip in the refreshing waters of the fenced-in swimming pool and air dry on a chaise lounge as the sun tans your face. Hanging out poolside is always a treat and it can be energizing or relaxing, whichever you personally prefer. North Myrtle Beach, South Carolina features fabulous attractions, award-winning restaurants and championship golf courses. There is plenty to do right down the street and just around the corner from this North Myrtle Beach resort. The Cherry Grove Fishing Pier is nearby and that is loads of fun for fishermen of all levels. What a great spot for beginners to cast a line into the Atlantic Ocean. Water sports in the area include banana boat rides, Sea Doo rentals and parasailing. Shop the outlet malls that are on Highway 17 and Highway 501, minutes from Coastal Dunes. Seafood restaurants feature fresh fish, shrimp, crab cakes, chowders and hush puppies. Dine on oysters and treat your family to delicious desserts. Play 18 holes of amazing Myrtle Beach golf when you vacation at Coastal Dunes. There are more than 100 Myrtle Beach area golf courses so making a tee time is not a difficult task. Playing 18 holes, however, can be challenging. Some of these holes are award-winning and quite tricky. Additional amusements in the area include water slides, the Myrtle Beach SkyWheel, kids’ museums, miniature golf courses and dolphin watch tours. Elliott Beach Rentals is not affiliated with onsite management or the HOA of Coastal Dunes.